Fermograph II monitors volume of gas produced by yeast leaven-ing during bread making process. 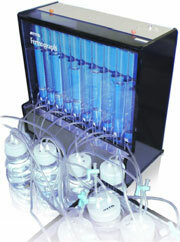 It can also be used to monitor fer-mentation process of alcoholic beverage like Japanese Sake, or bio-ethanol. Gas production is related to the fermentation kinetics of the yeast strain, provides some information on characteristics as bread dough quality, freeze-thaw stability, alcohol productivity, etc. of the strain. Fermograph II quantifies the gas volume as total (accumulated) and production rate at a user-set interval, stores the data, and export CSV data for spreadsheet calculation.